TRS candidate from Karimnagar B Vinod Kumar interacting with morning walkers at Lower Manair Dam on Sunday. Manakondur (Karimnagar): Sitting MP and TRS candidate from Karimnagar Lok Sabha constituency B Vinod Kumar on Sunday said the party would decide the Prime Ministerial candidate if it wins 16 of the 17 Lok Sabha seats in the State. 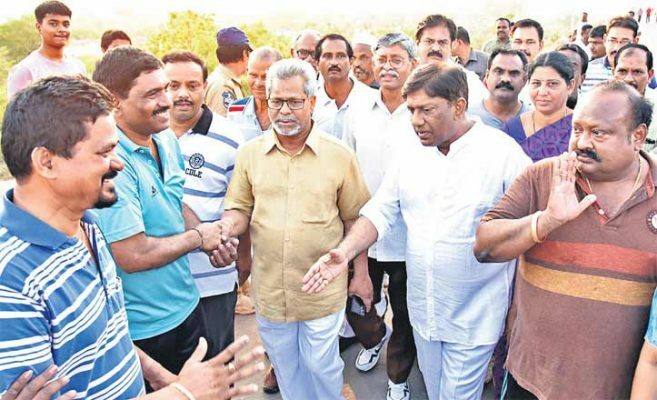 Addressing a road show as part of his electioneering in Manakondur mandal, Vinod said it was imperative that the TRS wins a majority of Parliamentary seats to protect the interests of the State. “It would be possible to get more funds from the Central government and obtain permissions for projects only if the TRS is strong at the Centre,” he added. Referring to the DMK and the AIDMK in Tamil Nadu, the TRS leader pointed out that these parties managed to get more Central funds and projects to their State because they could mount pressure on the Centre with their numbers. Stating that neither the Congress nor the BJP was in a position to form the government at the Centre in the present political scenario, Vinod said regional parties, particularly the TRS, would play a key role in the formation of government at the Centre. Listing out the initiatives of the TRS government, he said the government, to overcome power problems and to ensure supply of 24-hour power to the agriculture sector, was purchasing electricity from Jharkhand and Chhattisgarh. “I ensured that a national highway was sanctioned to the erstwhile Karimnagar district. 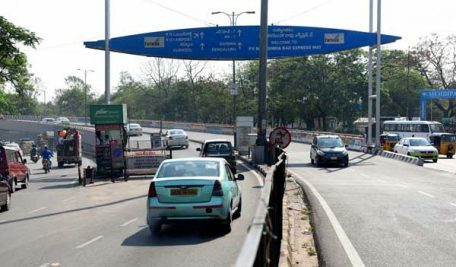 Karimnagar also got Smart City status, and subsequently, a total of Rs 1,000 crore would be sanctioned for the town in the coming five years,” he said. A cable bridge across Manair river near Sadasivpalli was being constructed at a cost of Rs 140 crore, he added. B Vinod Kumar, Karimnagar MP, on Sunday, said Karimnagar would be developed into a railway hub besides a junction for National Highways. Vinod Kumar working out at an open gym at Lower Manair Dam. Accompanied by MLA Gangula Kamalakar, MLC Naradasu Laxman Rao, Karimnagar Municipal Corporation Mayor S Ravinder Singh and others, the MP interacted with morning walkers at Lower Manair Dam. Later, the leader had a work out session at an open gym. Besides a train service to Mumbai on a regular basis, trains are being operated to Tirupati twice a week. More services would be launched to different places from Karimnagar in future, he said, adding that work on the Manoharabad-Kothapalli railway line was already completed up to Siddipet, and land acquisition and other works were in progress in Sircilla. He said people were appreciating the welfare schemes being implemented by the TRS government and was confident that the developmental activities undertaken by the government would ensure victory for all TRS candidates in the elections. People of Manakondur mandal accorded a warm welcome to Vinod Kumar when he arrived at the mandal headquarters as part of his campaign. People, particularly women, waited for the MP at Manakondur Chowk and invited him into the village after offering ‘harthi’. Amid drumbeats of ‘Oggu’ artists and ‘Kolatam’ performed by women, Vinod, along with Health Minister Etela Rajender and local MLA Rasamai Balkishan, took part in the roadshow at the mandal headquarters. Besides locals, people from surrounding villages also attended the meeting. After passing through small lanes, the roadshow converged at the ‘Ghadi’ area where he addressed a public meeting. 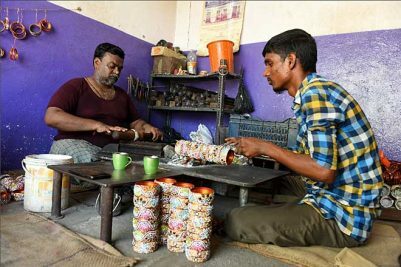 Speaking to ‘Telangana Today’, Syed Moizuddin, a local resident, praised Vinod for constructing a ‘Shadhi Khana’ in Manakondur at a cost of Rs 1.16 lakh from his MPLADS. Since there are a number of Urdu-speaking people in this area, Vinod took the initiative to establish Moulana Azad National Urdu University’s off-campus in Karimnagar. Moizuddin said the TRS government had also introduced several schemes for the uplift of the poor among Muslims. “Economically backward students from the community are reaping benefits of minority residential schools. ‘Shaadi Mubarak’ is a major relief for Muslim parents who find it difficult to perform the marriage their daughters,” he said. Sampath Reddy, a farmer from Rangapeta, said the distance between Karimnagar and Manakondur would be reduced drastically once the cable bridge being constructed across Manair was completed. “We used to face severe hardships since we could not ensure adequate water for standing crops due to insufficient power. All such problems are a thing of the past now after the launch of round-the-clock power supply for the agriculture sector,” he said, adding that Rythu Bandhu and Rythu Bhima had changed the lives of farmers. Karimnagar was the epicentre of the separate statehood movement and was in the forefront of the agitation. 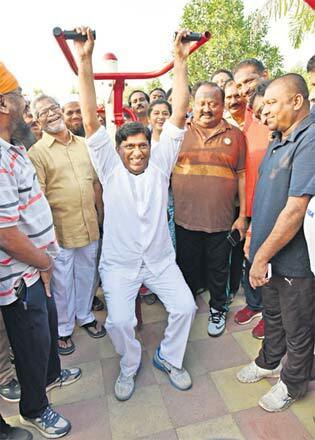 Chief Minister K Chandrashekhar Rao, who often says he has a sentimental attachment with the district, launched several programmes from this district. Karimnagar Lok Sabha constituency was one of the 489 segments that comprised first-ever Lok Sabha, elections for which were held between October 1951 and February 1952. The constituency comprises Karimnagar, Choppadandi (SC), Vemulavada, Sircilla, Manakondur (SC), Huzurabad and Husnabad Assembly constituencies, all of which elected TRS candidates in the 2018 Assembly polls. The district is dotted with famous landmarks, both ancient and new, including Sri Rajarajeswara Swamy temple at Vemulavada, Kondagattu Anjaneya Swamy temple and the Lower Manair dam among several other important sites of pilgrim and tourist interest. Politically, Karimnagar has a storied history of electing several important political leaders, including current Maharashtra Governor C Vidyasagar Rao and well-known former Congress leaders J Chokka Rao and M Satyanarayana Rao. This is also one of the few constituencies that saw two bypolls within a single Lok Sabha term. It was in 2004 general elections that Chief Minister K Chandrashekhar Rao was elected from Karimnagar to the 14th Lok Sabha, but two years later, he resigned from his seat, protesting the lack of action from the Centre on Telangana’s statehood demand. He was re-elected in the by-election in 2006, but once again resigned in 2008, only to be re-elected for the third time in the second by-poll the same year. Coalition governments formed earlier at the national level had not succeeded. What will be the difference between previous such efforts and the Federal Front being proposed by TRS? If one looks at the previous results, except for the BJP in 2014, no party got a full majority to form the government on its own during the last 30 years. People are vexed with the attitude of national parties. The mood of the people was reflected in 1989, 1991, 1996, 1998, 1999, 2004, and 2009 general elections. In this scenario, regional parties are playing a vital role in the formation of governments and reaping benefits by getting sanctioned big projects to their respected States. Similarly, the TRS will also play a key role if it manages to win 16 MP seats. The party will be in a position to dictate terms at the Centre if it has a sizeable number of seats and enjoys the support of other regional parties. How many seats will TRS win in LS polls? We will win 16 MP seats. People have already decided to give an opportunity to Chief Minister K Chandrashekhar Rao, who achieved separate Telangana State by waging a relentless agitation, to lead the nation. How is the response from the public for your campaign? People are giving me a warm reception. I feel very happy when people emphasise the need to get the highest majority instead of just a victory. What have you done for the development of Karimnagar Parliament constituency? Besides launching new train services from Karimnagar to other parts of the country, a new railway line, Manoharabad-Kothapalli, has been sanctioned. The work on the line is at different stages. Also, National Highways — Jagtial-Karimnagar-Huzurabad-Warangal (216 km), Karimnagar-Sircilla-Kamareddy-Pitlam (166 km), Sircilla-Siddipet-Jangaon-Suryapet (184 km) and Elkaturthi-Huzurabad-Siddipet-Medak (133) — have been sanctioned. Securing Smart City status for Karimnagar is another big achievement. A total of Rs 1,000 crore — Rs 200 crore a year — will be sanctioned under the scheme. Laying of CC roads and development of parks have already been taken up with Rs 250 crore.